After the Majapahit warriors subdued Ball in the 14th century, Javanese mini principalities and courts soon appeared everywhere, creating that unique blend occur and peasant culture, which is Bali highly sophisticated, dynamic and lively. The accompanying narrative for dance and drama is to a large extent based on court stories from pre-Majapahit Java. Even the Indian epics, another favorite of the stage, especially the wayang, use Javanese, complete with long quotes from the ancient Javanese Kakawin poetry. So Javanese culture, which disappeared from Java following Islamization in the 16th century still survived in Bali in a Balinese for which became classical ~Balinese culture. 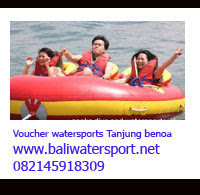 However, colonization brought about the fall of classical Bali. With the rural courts defeated and with new lords of the land, the centre of creativity shifted to village associations, and to the development of tourism. The 30's and 50's were particularly fertile decades; while the old narrative-led theater survived, lively solo dances appeared everywhere, accompanied by a new, dynamic kind of music called gong kebyar. This trend continued in the 60's and 70's with the creation of colossal sendratari ballets, representing ancient Indian and Javanese stories adapted to the needs of modern audiences. 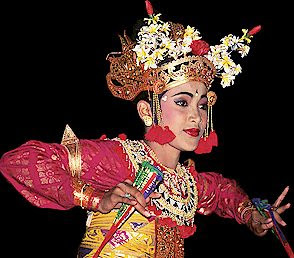 The typical posture in Balinese dance has the legs half bent, the torso shifted to one side with the elbow heightened and then lowered in a gesture that displays the suppleness of the hands and fingers. The torso is shifted in symmetry with the arms. If the arms are to the right, the shifting is to the left, and vice versa. Apart from their costumes, male and female roles can be identified mostly by the accentuation of these The women's movements. Legs are bent and huddled together, the feet open, so as al a sensual arching of to reve the back. The men's legs are arched and their shoulder pulled up, with more marked gestures, giving the impression of power. Dance movements follow on from each other in a continuum of gestures with 110 break and no jumping (except for a few demonic or ,animal characters). Each basic posture (agem), such as the opening of the curtain or the holding of the cloth, evolves into another agem through a succession,, of secondary gestures or tandang. The progression from one series to the other, and the change from right to left and vice-versa, is marked by a short jerky emphasis called the angsel. The expression is completed by mimicry of the face: the tangkep. Even the eyes dance, as can be seen in the baris and trunajaya dances. Balinese music is based around an instrument known as the gamelan. The gamelan is such a central part of Balinese music that the whole 'orchestra' is also referred to as a gamelan. Gamelan music is almost completely percussion. Though it sounds strange at first with its noisy, jangly percussion it's exciting and enjoyable. Probably the best known of the many Balinese dances, the Kecak is also unusual in that it does not have a gamelan accompaniment. Instead the background is provided by a chanting 'choir' of men who provide the 'chak-a-chak-a-chak' noise. Tourists especially enjoy the performance staged by the Kechak dancers. This dance is also deeply rooted in local tradi- tion and Indian mythology and is inspired by Ramayana, an epic poem written in Sanskrit. The dance brings to life the tale of King Rama, his wife Dewi Sita and his brother Laksamana who were exiled to the forest for 14 years following some complex scheming in a struggle for power. 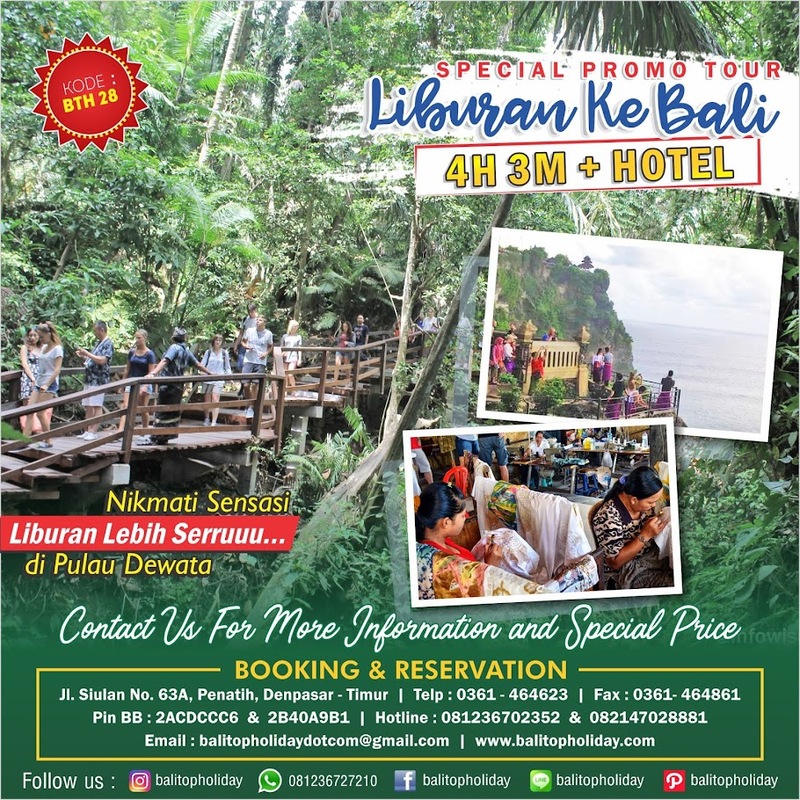 In the forest, they are persecuted by Rahwana, the ogre king who then abducts Dewi Sita and makes her a prisoner of his palace on the Island of Lanka (Ceylon) . Rama strikes an alliance with the monkey people whose army de- feats Rahwana’s troups, making it possible for King Rama to rescue his wife. 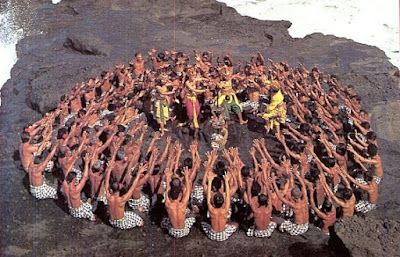 In each Kechak performance, a hundred or so dancers play the monkey army while a few female dancers are assigned specific roles (Dewi Sita, Trijata). The performance generally lasts one hour and takes place in the evening, preferably around 7 PM. It's the most popular dance for tourists. A straightforward battle between good, the barong, and bad, the rangda. The barong is a strange creature, half shaggy dog, half lion, propelled by two men like a circus clown-horse. The widow-witch rangda is bad though and certainly not the sort of thing you'd like to meet on a midnight stroll through the rice paddies. The Barong dance is truly a triumphant display of bright colors and graceful movements. Greatly appreciated by the tourists, special performances are staged for their benefit, generally in the morning, and last one hour. The villages of Batubulan as well as Tegaltamu and Singapadu, small towns located 30 minutes from the capital, are known for putting on the best performances. 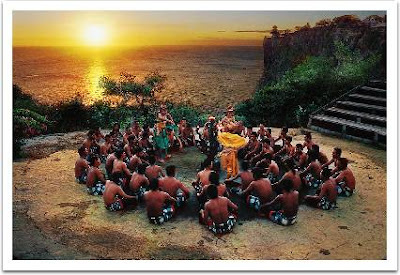 There is, however, more to the Barong dance than the folkloristic dimension, It is, in fact, an integral part of the island's culture and has an evident sacred connotation. It isn't rare, in fact, to see the Balinese dancing the Barong during their religious ceremonies, regardless of the presence of tourists. Inspired by an episode taken from Mahabharata, an epic poem written in Sanskrit. the dance evolves around the character of the Barong, the king of the jungle. A mythical animal, not clearly identified (perhaps a lion), he is the symbol of virtue and good, subject to the continuous struggle against the evil forces that threaten life and the integrity of the forest, this being an element very dear to the Balinese population. In detail, the Barong embodies everything that can be beneficial to man, and help him defeat illness. black magic and any other kind of misfortune. The evil entity against which he must relentlessly fight is personified by Rangda, queen of death and devourer of children. She is characterized by a dark and gloomy mask from which a red tongue of fire hangs. The entire dance is centered around the struggle between these two rival characters. The Barong is interpreted by two dancers whose rhythmic movements bring to life the beautiful and elaborate cos tume they wear. a large animal head skillfully carved out of wood, brightly colored in red, white, black and gold. It is adorned with a crown extending outwards from the sides of the head, and by a prominent necklace which hangs from the neck, The final touch of the costume is a tail made out of bison leather which is elaborately finished and guilded. The first character to appear on the stage is the Barong with his swaying gait: his dance is meant to express the joy of living. He is followed by a group of armed supporters who stand ready to defend him. When Rangda strikes her terrible blows. It isn't at all rare for the dancers playing the Barong's followers to become so engrossed in the sacredness of the per- formance that they go into a real trance. A cloud of characters surround the Barong on stage. Rangda, goddess of death, personification of evil, the young girl servant Kalika; Dewi Kunti, queen of the kingdom of Hastina and her stepson Sadewa who will be sacrificed in order to placate the anger of Rangda, the minister Dewi Kunti; Patih who ex- presses sorrow for the fate of Sadewa (Rangda will have to enter his soul in order to make him accept the sacrifice), and then the monkey supporters of the Barong, producers of palm tree wine (nira). A very important element in the entire dance is the large orchestra, known as gamelan, which is essential to underscore the ritual nature of the performance. Many are the instruments that make up the orchestra: some metal xylophones which stand out not only because they are so numerous but because of their power ful and imperious sound; there are also drums as well as flutes, the rebab (a type of violin) and the gender (typical xylophones). All together, these instruments are essential in guiding the dance and underscoring the rhythm of well coordinated movements. These along with the joyful colors are the most alluring elements of this remarkable perfor mance. At the end of the dance, the masks of the Barong and of Rangda, as proof of their sacred nature, are stowed in a special room inside the temple. They are covered very carefully, especially Rangda's mask, because its deadly powers are greatly feared. It's a way of saying that the ritual victory of the Barong, that is of good, which marks the end of the dance, is only temporary: tomorrow the eternal and unresolved conflict could begin again. The end of the Barong dance is like an entirely separate performance. Also known as the Kris dance, it is named after the famous Malese dagger. The idea is based on the philosophical concept rwa bhineda. good and bad, evil and goodness which have always been present and have always existed together albeit in a constant and inevitably unre solved conflict. Nothing will change in the future. While man is left free to try to develop his positive attitudes and let them win over the negative ones, he must nonetheless resign himself to the fact that the presence of both good and evil is a law of nature and as such must be accepted. When the dance is performed, Rangda is the evil spirit which enters the bodies of his victims, usually followers of the Barong, and pushes them to the edge of suicide. The dancers attempt to stab themselves in the chest with their krises until they are finally stopped by the beneficial appearance of the Barong. It is he who will save these unfortunate beings by revealing that the notion of good and evil will always be inevitably present in the world and in everyone's life and that they must therefore accept it. 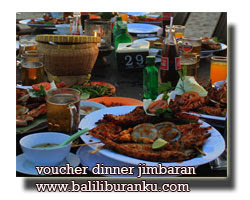 In the Barong play, Bali's mythical guardian, Barong, battles Rangda, the demon - Queen. 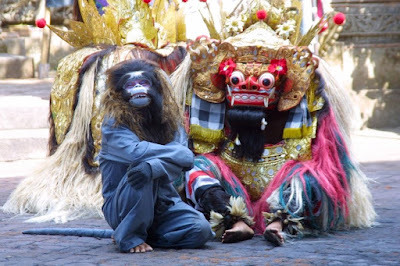 barong's supporters are a group of Balinese men with the natural ability to enter a trance state. They are armed with a kris ( traditional sword). Rangda insults Barong and taunts the men- enraged and in a trance they attack her! But her powers are so strong that they are knocked out. When they come to they are so distressed by their failure, that they try to impale themselves on their kris. But their trance state amazingly protects them from injury. It's the most graceful of Balinese dances. A legong dancer is known as a young girl, often as young as eight or nine years, rarely older than her early teens. There are various forms of the Legong but the Legong Kraton is the one most often performed. The warrior dance, known as the Baris, is traditionally a male equivalent of the Legong femininity and grace give way to energetic and warlike martial spirit. Basically, it tells the same story of Rama and Sita as told in the Kechak but without the monkey ensemble and with a normal gamelan gong accompaniment. It's a male solo dance like the Baris but with greater emphasis on the performer's individual abilities. There are various forms of Kebyar including the Kebyar Duduk and Kebyar Trompong. The Janger is a relatively new dance which suddenly popped up in the '20s and '30s. Today it has become part of the standard repertoire and no longer looks so unusual. A mask dance where the dancers have to imitate the character represented by mask. A full collection of Topeng masks may number 30 or 40. Closely liriked to religious ceremonies and processions, and danced as a ritual interval, the Topeng dance ultimately takes on a sacred connotation. As a matter of fact, foreigners are allowed to see the dance only if they behave appropriately and respectfully. Actually, some performances are staged only for the benefit of the tourists, but do not enjoy the same following of the Barong and Kechak dances. Peculiar components of the Topeng dance are the masks used to hide the faces of the dancers. Specific attributes are used, instead, to identify the characters (a mustache and thick eyebrows for the elder, arrogance and defiance for Patih, and so on). The rhythm of movements (perfectly in accordance to the age and role of the character) is underscored by a large orchestra, the garnelan, which is essential for the success of the performance. Also a mask dance but strictly a solo performance. It's an everyday dance of the temples, a small procedure to go through before making temple offerings. The Sanghyang trance dance originally developed to drive out evil spirits from a village. The Sanghyang Dedari dance is performed by two young girls who dance a dream-like version of the Legong but with their eyes closed. The Sanghyang Jaran, a boy dances around and through a fire, riding a coconut palm hobby-horse. In both dances, a priest is always on hand to help bring the dancers out of their trancestate at the end of the performance.